The Total Garage is locally owned and has been serving the Boise, Meridian, Eagle, Star, Middleton surrounding Idaho cities since 2007. Our garage professionals have over 30 years combined construction and home improvement expertise who are committed to providing homeowners with highest standard of quality in custom garage cabinets, epoxy garage floor coatings, garage storage systems, saferacks overhead storage, attic ladders, and much more. The Total Garage is locally owned and operated. We specialize in transforming that dull, gray and oil stained garage floor into a durable, easy to clean and beautiful floor space. With our storage solutions, your garage can be organized, stylish and uncluttered, instead of messy, ugly and embarrassing. 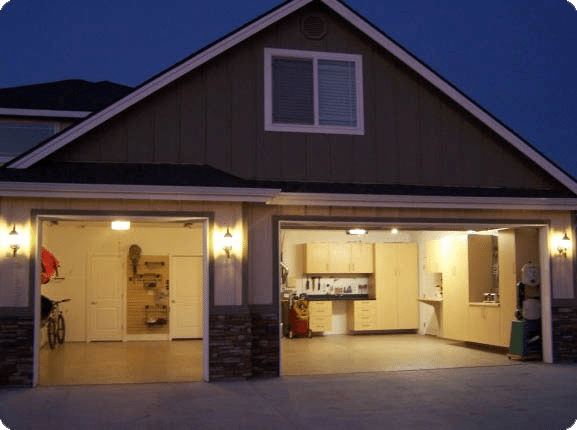 Your garage is one of the largest rooms of your home, yet is one of the most under-utilized. Start with a new garage floor and some basic wall storage, or create your dream garage with a full makeover. We work on projects of all sizes, scopes, and budgets.